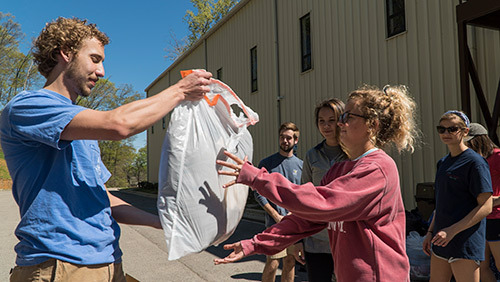 On a beautiful early spring day, nearly 1,000 Samford University students volunteered their time and resources to serve more than 40 ministries and organizations across the metropolitan Birmingham area during the annual Samford Gives Back Day. The day of community engagement and service was coordinated by Samford’s Frances Marlin Mann Center for Ethics and Leadership. Center director Drayton Nabers noted that the participation was a 45 percent increase over previous years. Samford’s historic relationship with the East Lake community was evident with the students working on several projects at East Lake United Methodist Church near the location of the university’s initial Birmingham campus. In addition to painting and other update projects inside the buildings, students worked on a community garden that began last year. According to Cheryl Hinnen, a 2006 Samford graduate and associate pastor at the church, the garden serves as an educational space for children in the neighborhood, for the church’s feeding ministry and for summer nutrition classes. Student leader George Keller worked on the garden last year and returned to assist this year. Keller is a sophomore political science major from Mountain Brook, Alabama. Nearby at the Lovelady Thrift Store in East Lake, members of the new Delta Delta Delta sorority were participating in their first Samford Gives Back Day. The Samford students were assisting with several projects, including preparation for a fashion show for the women served by the Lovelady Center. The center assists women who are recovering from drug or alcohol addiction. “There are a lot of great women that I have met who are excited for us to be here, excited to work with us,” said Tatianna Turrentine. “They deserve all the help they can get because they are working toward a really different thing—sobriety.” Turrentine is a sophomore political science major from Phenix City, Alabama. At Magic City Woodworks near downtown, director Lawrence Sheffield praised the ongoing relationship the organization has with Samford’s Alpha Tau Omega fraternity. Members work at the organization’s workshop and warehouse throughout the year, but for Samford Gives Back Day, they were painting spaces and clearing exterior areas. The four-year-old ministry offers one-year paid apprenticeships to “help young men bridge the gap between unemployment and employment” through the art of woodworking, Sheffield said. Samford’s ongoing partnership with Cornerstone Schools of Alabama was reinforced by dozens of students who worked at the middle/high school facility in the Huffman area of Birmingham. Students painted hallways and helped with spring clean-up outside. Katie Neisler, a senior from Jacksonville, Alabama, and a member of Samford’s volleyball team, was mowing grass while other students were clearing debris from gutters. Joy Wilkoff, a sophomore English major from Birmingham, said she had heard about Samford Gives Back Day from friends and wanted to participate. “I like that we are making this space better for the students who attend Cornerstone,” Wilkoff said while wielding a paintbrush. At a gathering in Samford’s Wright Center Concert Hall before students dispersed to work sites, Cornerstone’s director of athletics Dedrick Agee praised the involvement of Samford students in Cornerstone’s ongoing ministry. Samford will be partners with Cornerstone and New Rising Star Missionary Baptist Church to provide a series of sports camps this summer. Participating in Samford Gives Back Day and other opportunities can “lead to a life of servant-leader. I was awakened to a life of service at Samford Gives Back Day last year, and I hope the same happens for you,” Savage said. With reporting assistance from Erin Bognar, BJ Millican, Brad Radice and Olivia Williams of the Division of Marketing and Communication.